Along University Boulevard near The Oaks retirement home, there is a pedestrian-activated signal that stops traffic when a button is pushed by a person waiting to cross. These signals are fairly common on roads in suburban Maryland, and they are visually similar to the type of signals used at fire stations across the state. They have three stacked lights on each signal head: a big red light, a big yellow light below that, and a small yellow light on the bottom. When not activated by a pedestrian, they small yellow lights flash in tandem at a steady rate as an advisory to motorists. The type of signal in question. The small yellow lights on the bottom flash constantly. All photos by the author. Is it the distance, or the road? Yesterday, a story aired on WJLA about children who have to walk up to 1.5 miles to Eastern Middle School in often dangerous conditions. The story focused largely on the distance children have to walk, since any student within 1.5 miles of the school is not eligible for busing per county policy (parents have requested busing to give their kids a safer trip to school). However, I think this situation is also an opportunity to examine how the design of one road, University Boulevard, makes this walk both uncomfortable and dangerous. Narrow sidewalks at the curb are standard on most of the county's six lane roads. They're also known to be the most dangerous pedestrian facility imaginable. Photo by the author. Eastern Middle School draws a large portion of its students from the neighborhoods south of the school along the University Boulevard East corridor, from Franklin Knolls down to New Hampshire Estates. From any one of these neighborhoods, walking along University Blvd is the most direct route to reach the school, since adjacent neighborhood streets are disconnected or very indirect. We don't have much in the way of public art here in Four Corners, but wouldn't it be nice if we had more? One of the more visible forms of public art are murals, of which there are many in Silver Spring and Takoma/Langley. Most of these seem to be on the sides of commercial buildings, where formerly blank walls are now filled with colorful scenes. 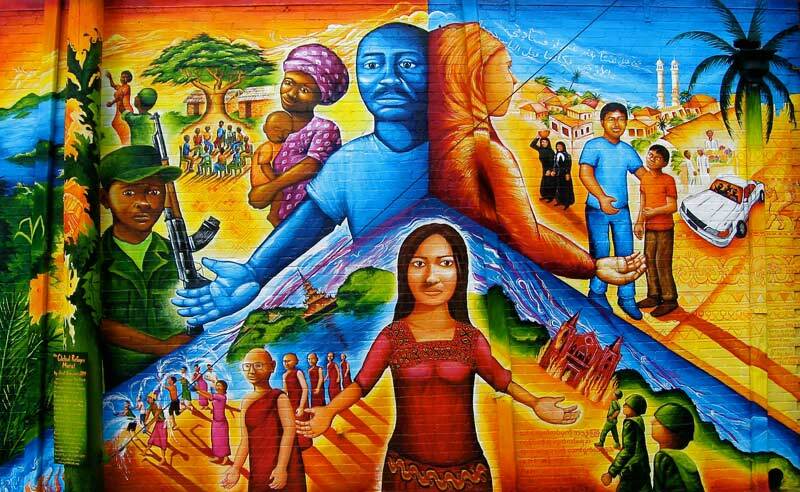 Refugee inspired mural on the side of Kefa Cafe in Silver Spring. Photo from Mural Locator. 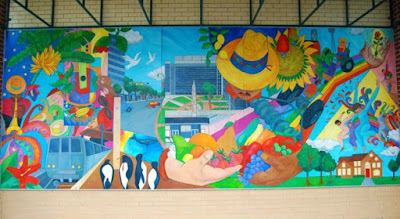 Mural on the side of Whole Foods in Silver Spring. Photo from Mural Locator. For 33 years, Indian Spring Country Club was very much the center of Four Corners' life. The club, which was located on the combined land of Blair High School, the YMCA, Indian Spring Terrace Park, and the Beltway operated between 1924 and 1957. While the club moved away almost 60 years ago (and closed permanently in 2007), its' influence remains. It probably shaped the development of the modern Four Corners we know today more so than any other factor. Indian Spring Terrace Park is comprised entirely of land that was once the golf course (this sign seen from the aptly named Fairway Avenue). The trees in the background on the left side of this sign date to when the course was still open. Photo by the author. The club was founded as "Indian Spring Club" by movie theater magnate Fayette Thomas "Tom" Moore in 1924. In that year, there were no built subdivisions around Four Corners at all. The only homes in the area were on small farms surrounding the rural crossroads. The location was far out in the countryside for the day, with the population of Montgomery County being just 34,000. "The first of a series of club events which the golf committee of the Indian Spring club has arranged for the entertainment of the members of that organization occurred yesterday. Sixty-four players, divided into foursomes were arranged in two teams under the captaincy of Tom Moore, president of the club, and Basil M. Manly, and competed in a round of eighteen holes." A large explosion and fire occurred at the Flower Branch Apartments near Arliss Street & Piney Branch Road just before midnight last night. Dozens of people lost their homes and belongings in this fire. Information about helping those affected can be found here. The blast caused significant structural damage to the building, and it started a large fire which went to two-alarms on initial dispatch. This complex is in the "first due" response area of Station 16, and all four pieces of apparatus from the station responded to the call (Paramedic Engine 716, Truck 716, Ambulance 716, and Breathing Air Unit 716). The fire engine and ladder truck from Station 16 were first arriving on the call. 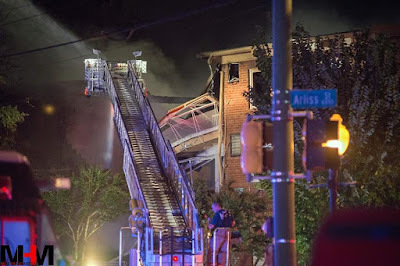 The fire engine and ladder truck from Four Corners remained at the site assisting investigators until late in the evening. 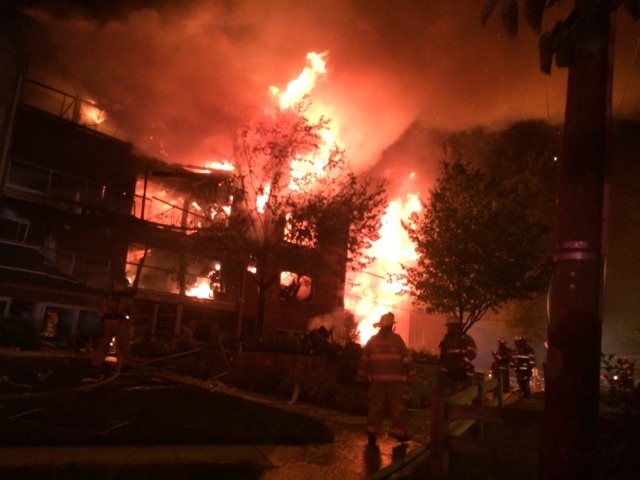 Image from the Fort Detrick-Forest Glen Fire Department, who responded on the second alarm. Tower 719 of Montgomery Hills flowing water into the area most affected by the explosion. Mike Hugg Photography. Why no crosswalk at Crestmoor? "Thirteen hour turning movement counts of the intersections did not reveal significant volumes of motorists exiting from the side streets to warrant traffic signals or significant pedestrian activity at the intersections. Peak hour reviews at the intersections suggested that observed delays and queues were not unlike similar intersections in Montgomery County. A review of the most recently available three year police reported crash at both intersections history did not indicate a pattern that is correctable by installing a traffic signal at either location or a pattern of pedestrian related crashes. In addition, our review of the sight distance indicated that adequate sight distance exists for motorists approaching US 29 (Colesville Road) at Crestmoor Drive to allow pedestrians to cross safely and legally. ...For these reasons, a marked crosswalk is not justified at this time at US 29 (Colesville Road) at Crestmoor Drive." Safe by engineering standards? Sure. Safe in anyone else's opinion? Not even close. Photo by the author. "SHA agrees this bus stop is in a less than desirable location. There is continuous sidewalk on the other side of U.S. 29 leading all the way down to the intersection at Southwood Drive [sic], therefore there is no compelling reason anyone should be crossing U.S. 29 in an attempt to use this mid-block bus stop." Here's a question for the reader to ponder: In the late 1950's, why was Route 29 expanded from a 2 lane road to a 6 lane highway? The simplest answer is "convenience". The old road was becoming overwhelmed by rising traffic volume, which was causing motorists to be delayed in their travels. Since the state recognized that this delay was inconvenient to said motorists, they widened the road to move them along quicker. It's a simple concept. Back to the sorry bus stop. Is there really no compelling reason for someone to use it, as the SHA spokesman asserts? The bus stop on southbound Route 29 at Crestmoor Drive is one of the most dangerous bus stops imaginable. It's built into a steep hill, and due to this terrain, there is no sidewalk leading to or from the stop from the North Four Corners side of the highway. The stop can only be accessed by crossing 6 lanes of Route 29 in an area with no marked crosswalk. The situation of the bus stop is so absurd, it is almost macabre. Thanks to a competition at Streetsblog, our dangerous bus stop is in the running to become "America’s Sorriest Bus Stop". Our sorry bus stop. All photos by the author. The bus stop was nominated by my friend and fellow blogger Dan Reed of Just Up The Pike. The Streetsblog contest is a March Madness-style completion, where voters determine which bus stop is worse through 4 rounds. Currently, the Crestmoor stop is in the Elite Eight, and it has far more votes than its current opponent, another sorry bus stop located in Asheville, NC. The polls for this round close tonight, and it looks like the Crestmoor stop is headed for the Final Four (but vote for it here anyway! ).